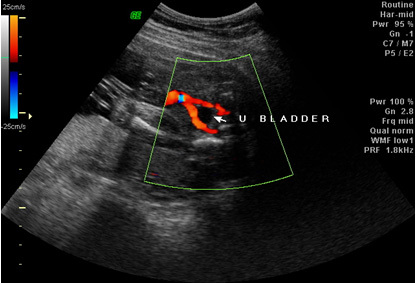 The USG protocol that is followed in pregnancy includes one 11-13+6 weeks scan as a screening scan which includes an assessment of Nuchal translucency (or NT). NT assessment is a very valuable parameter in early pregnancy and gives the sonologist an opportunity to identify a fetus at risk for trisomy 21, or other chromosomal disorders, and a wide range of genetic syndromes. 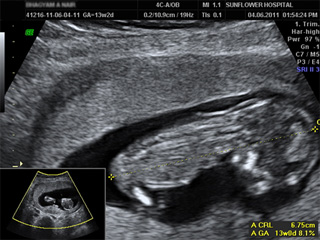 The 11-13+6 weeks scan also establishes viability, accurate dating of pregnancy and detection of multiple pregnancies. 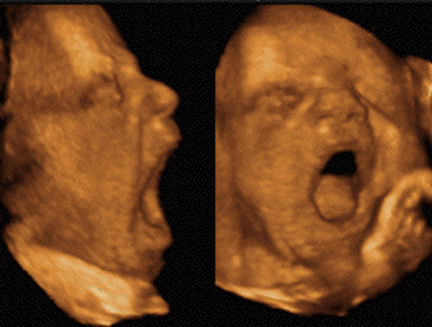 3D-4D images of the unborn child. Pregnancy and organ development of baby is a continuous ongoing process of 9 months and just a single scan is not enough to stamp normalcy of fetal organs. Trans cerebellar view of fetal brain showing cerebellum, vermis, cisterna magna, hind brain and posterior fossa. The Transvetricular view of fetal brain showing lateral ventricles and choroid plexus. The trans-thalamic view of fetal brain showing thalamus, midline third ventricle and cavum septum pellucidum. 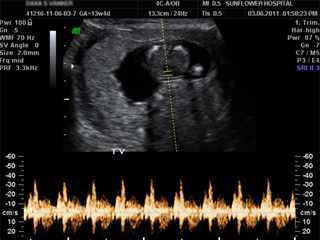 4 chamber view of fetal heart showing two ventricles, two atria, crux of heart, interventricular and interatrial septum. 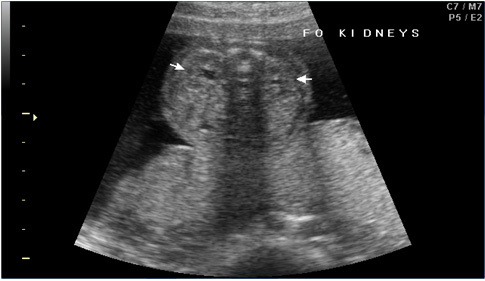 Trans mid abdominal view showing both fetal kidneys. View of lower abdomen showing fetal urinary bladder with two umbilical arteries. 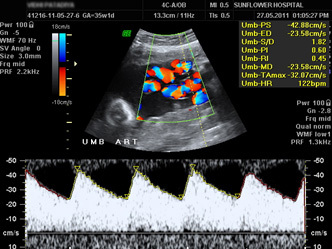 Uterine artery Doppler showing high resistance flow and low resistance flow in a routine anomaly scan. Hence we follow up in all patients with the growth scan and color doppler at around 28 weeks. Color doppler of umbilical artery, middle cerebral artery, fetal aorta, ductus venosus and maternal uterine arteries with calculation of RI (Resistance Index), PI (Pulsatility Index) and S/D ratio (Systolic/Diastolic ratio) gives an idea of normalcy of blood flow in fetus. Any abnormality in these indices or in blood flow pattern is a pointer towards various pathologies setting in the fetus e.g. IUGR, Brain sparing effect, pregnancy induced hypertension etc. 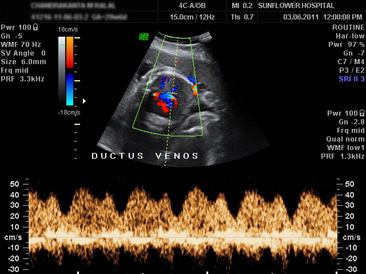 Fetal ductus venosus shows A (Atrial systole), D (ventricular diastole) and S (ventricular systole) waves. The Fetal ductus venosus directs the oxygenated blood returning from placenta to the left atrium via the formen ovale, ensuring oxygen supply to coronary arteries and brains. The regulation of oxygenated blood flow returning from placenta to fetus depends on the resistance in DV. Middle cerebral artery of fetal brain shows continuous forward flow throughout the cardiac cycle and has a relatively high pulsatility.